Among other things, the essay explains the purpose of the critical reflection essay, a key element of practice-based disciplines in higher education. Such an essay allows the process behind practice to be made explicit and documented, separately from the creative work itself. It helps to square professional thinking and the scholarly demand for a demonstration of ‘research-equivalent’ activity. 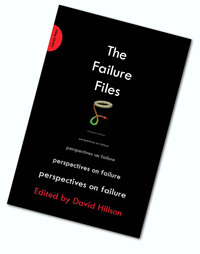 It is also a way of acknowledging the inevitability and value of failure as an aspect of discovery, and as a way of engaging critically with others.